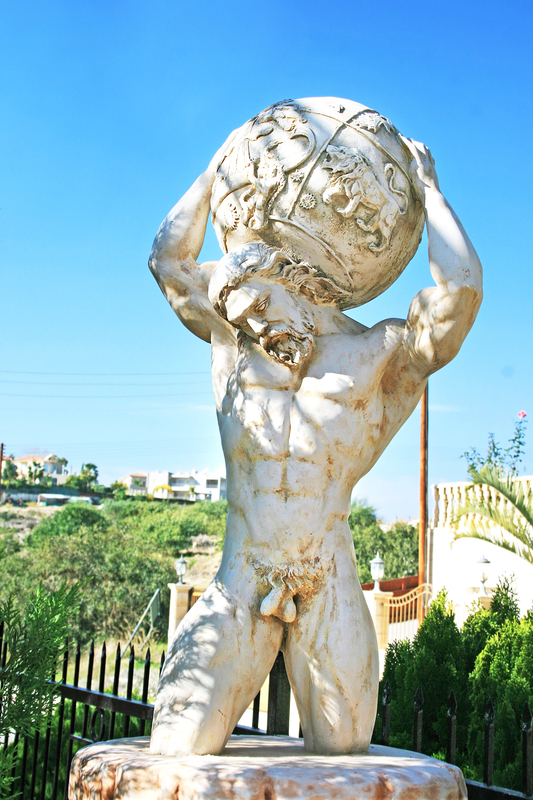 Garden statue of Atlant holding the world on his shoulders . 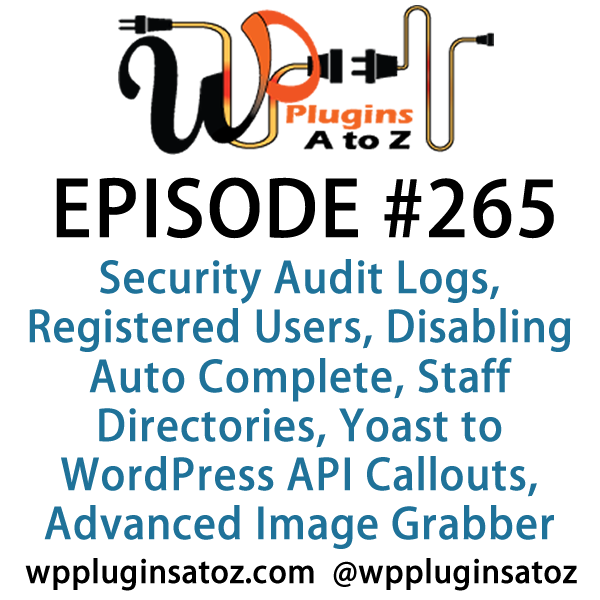 It's Episode 265 and we've got plugins for Security Audit Logs, Registered Users, Disabling Auto Complete, Staff Directories, Yoast to WordPress API Callouts, and a great new plug that pulls any image on any website into your media library.. It's all coming up on WordPress Plugins A-Z! My newly created Membership Coach program is your go-to resource for all the Training, Advice, and Support needed to Develop and Grow a Profitable Membership Site. Be sure to head over to MembershipCoach.com and get on the waiting list for the first sessions, launching soon. You can also follow @membershipcoach on twitter to get the latest release dates and news. Signups are now active and Pre-Launch Enrollment is open! For those who have asked about Patreon we will have a Patreon account launching in a couple weeks where you can donate on a monthly basis. We will be offing as an incentive plugin tutorial videos on how to setup and use the plugins we review and use. Thanks for taking the Tailor page builder for a test drive! I’m glad to hear you liked it though it’s a shame it didn’t work with the premium theme you tried (this was no doubt a conflict with whatever builder you were using; I should add that to a disclaimer somewhere :D). I just wanted to clarify that it is in fact possible to edit posts as well: you just need to enable them from within the plugin settings (Settings > Tailor). Does that afford another half dragon? Thanks again for a positive review and keep up the great work! Do you need to lock down your site to be registered users only and if anyone else hit it they only can get to the registration/login page? This is a plugin for you in its simple form just check and box and your off to the races. I inherited this plugin with a client that runs an intranet and it was modified and I have had to adjust it further so you can allow the site to open for for an IP range or a specific IP. When used with Gravity forms and the other plugins mentioned in this show you can even have it so they can register only though a specific email address and more. This is the first of many plugins to come from WordPress Plugins A to z. 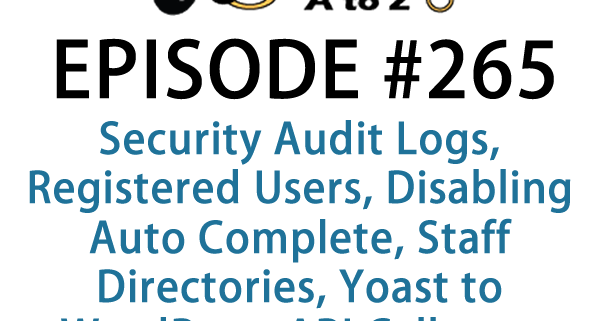 This one is a fork of the Staff directory plugin https://wordpress.org/plugins/staff-directory/ aside from the change Adam Tootle has made in is plugin for his recent version which we won't be using we have add more functionality to the plugin. Which allows the creation of a staff list that you edit in the back end and can display in the front end via short code. We have added ajax sorting for the front end as well as the back. the ability to export the csv file and to import the csv file. We have cleaned up the editor and created an ajax search function. All in all it is pretty great plugin now we are still doing some cleanup of the interface and more will come over time for the plugin but if you need a simple staff directory check this out. There is another Plugin in the dev cue right now that help you create an intranet and lock your site down to registered users. Advanced Image Grabber can import all images into your media library from external webpage urls. 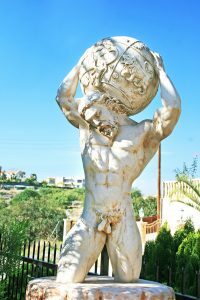 You can select the images to upload and import select. With so many autocomplete scripts available (within Chrome, Firefox, LastPass, etc) there are a lot of different ways that sensitive data could get saved within your browser. This plugin prevents items from being saved in your saved passwords or LastPass. Returns Yoast post or page metadata in a normal post or page request. Stores the metadata in the yoast_meta field of the returned data. I wanted to bring this plugin to light not because I think a ton of people will be using it, but to highlight and illustrate the point that these kinds of plugin interactions with the API are coming faster than you think.